Crispy French fries are a popular household staple and offered as a side dish at most fast food outlets. It is difficult to keep your hands off of them until they are finished. But are French fries healthy or are they dangerous? There surely must be some disadvantages of eating French fries, after all, they are fried potatoes without the skin. You should be aware of the disadvantages on your health so that maybe next time, you will have only a few sticks of fries. So, what are the disadvantages of eating French fries? Read on to find out. 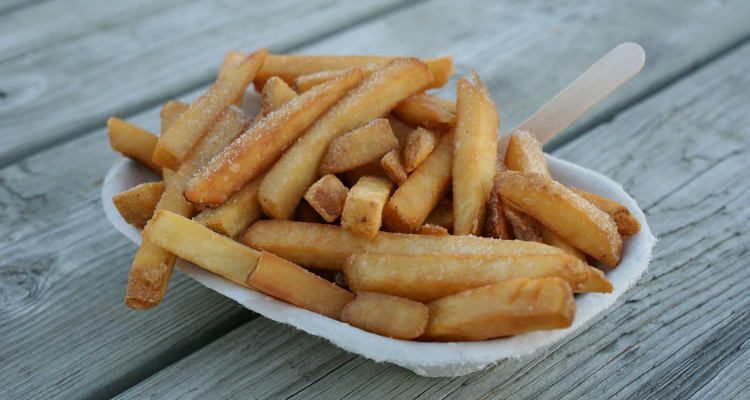 Here are the four main French fries health risks you should know. French fries are high in carbohydrates and bad fats. One serving of French fries contains 63 grams of carbohydrates. Carbohydrates, when consumed in moderation, are beneficial to the body as they give us energy. Fiber is also a type of carb which aids digestion and restricts the excess release of insulin. However, in French fries, potatoes are peeled which strips them of the fiber. When you eat a lot of fries, you are ingesting starch and added salt, as well as fats from the oil used to make them. So, if you consume French fries in excess, it may lead to type 2 diabetes, obesity, heart disease, and cancer. French fries are sprinkled with high amounts of salt, which when consumed for a longer duration, affects the health adversely. A high intake of salt leads to high blood pressure, which may lead to heart and kidney ailments and stroke. The Institute of Medicine recommends consuming 1,500 to 2,000 milligrams (or half teaspoon) of salt per day. But, the average American consumes around two teaspoons of salt every day. One serving of French fries contains about one-third of the recommended daily intake (RDA) of salt, or more than 600 milligrams of it. Are French fries fattening? Deep-fried French fries contain high amounts of fats that can make you overweight. One serving of French fries contains 24 grams of fats. A person’s daily diet should not include more than 65 grams of fats. According to a study conducted by the Diabetes and Obesity Center of Excellence at the University of Washington in Seattle, a diet high in fats injures the brain nerve cells that control body weight. French fries contain high amounts of saturated and trans fats. They are known to increase blood cholesterol, which in turn increases the risk of stroke, heart disease, and type 2 diabetes according to the American Heart Association. Also, the excess salt or sodium chloride in French fries may lead to water retention in the body causing weight gain. According to a research study conducted by the Nuremberg Biomedical and Drug Research Institute, pregnant women should avoid consuming French fries due to the presence of acrylamide. Acrylamide is a carcinogenic and neurotoxic agent. Acrylamide is found in foods fried at higher temperatures of more than 365°F. Fetuses and newborns are more susceptible to acrylamide as the blood-brain barrier in them hasn’t developed. Another study published in the Plant Biotechnology Journal states that starchy foods when fried, baked, or roasted at higher temperatures produce acrylamide. So, you should avoid frying food for a long time, reusing oil, or heating it excessively. To know the effects of fried potatoes on health, researchers divided the participants depending on their potato consumption per week. The eight-year longitudinal cohort study published in The American Journal of Clinical Nutrition states that people who consumed fried potatoes two to three times per week or more were at an increased risk of mortality. Consuming potatoes in other forms is not linked to mortality. The National Potato Council CEO, John Keeling, says that the study includes only patients with arthritis and so it isn’t relevant to the general population. Dr. Nicola Veronese, lead author of the study also says that other factors including a sedentary lifestyle, obesity, and high quantities of salt may also play a role in mortality. Does all this mean you should never eat French fries? No, you can have them sparingly. Also, try making French fries at home so that you know how much salt you add and the type of oil you use. Also, when possible, substitute potatoes with sweet potatoes or make French fries in a microwave using only a couple of tablespoons of oil. So, now that you know the disadvantages of eating French fries, eat them in moderation and only once in a while. Rommens, C.M., et al., “Low-acrylamide French fries and potato chips,” Plant Biotechnology Journal, October 2008; 6(8): 843-853. doi: 10.1111/j.1467-7652.2008.00363.x, last accessed June 15, 2017.